What about this NBA season’s conference finalists? What’s their star makeup, and which past champion(s) does each most closely resemble? The defending champion Warriors are once again led by Stephen Curry, who this season put up the fourth-best BPM (12.4) in NBA history. As with last year, Curry’s second fiddle (in BPM terms) is Draymond Green, ninth in the league in BPM (5.9) in 2015-16. While Curry and Green’s BPMs improved this season, Klay Thompson’s fell from 2.7 to 0.7, rendering the Warriors a two-star team (Bogut’s is 4.4 but his minutes are limited). If they win it all, they’ll be just the tenth team in the past 40 years to do so with only two players at 2+ BPM (24+ MPG). As much as we tend to think of the Warriors as well balanced, their best BPM parallel is the top-heavy 2000 Lakers, with Curry (12.4) as Shaq (9.7), Draymond (5.9) as Kobe (5.3), Bogut (4.4 in 21 MPG) as Horry (4.1 in 22 MPG), and Iguodala (1.6) and Thompson (0.7) as a rich man’s Ron Harper (0.7) and Glen Rice (0.4). Steven Adams isn’t quite an All-Star sidekick, but he fits the 2+ BPM, top-fifty-in-the-NBA bill. The Thunder’s BPM cousins are the 2012 Heat - but with more combined production and balance at the top, and a (in-BPM-terms) superior third wheel in Adams (Chalmers was third; BPM dislikes Bosh) - and the 1980 Lakers, when Kareem and Magic were second and third in the league in BPM, and Jamaal Wilkes was a strong three. In the east, the Cavaliers are, of course, led by LeBron James. His 9.1 BPM was third in the NBA this season (behind Curry and Westbrook) and 37th best in NBA history. His number two man is Kevin Love (2.5 BPM, 40th in the NBA). As far as BPM is concerned, the 2016 Cavs bear an eerie resemblance the 1987 Lakers, with LeBron (9.1) as Magic (8.1), Kevin Love (2.5) as James Worthy (2.3), Kyrie Irving (1.6) and Tristan Thompson (1.5) as A.C. Green (1.7) and late-career Kareem (1.6), and J.R. Smith (1.3) and Channing Frye (1.1) as Michael Cooper (1.2) and Byron Scott (1.1). Meanwhile, the outmatched Raptors offer nothing in the way of BPM stardom (or even near-stardom) beyond Kyle Lowry, whose 6.8 in 2015-16 was seventh in the NBA. Lowry is the only Raptor with a BPM of two or more, meaning there is no past champion to which they can be compared. Seven teams since 1977 won it all with only one star at 3+ BPM, but every single one of them had a running mate at 2+. 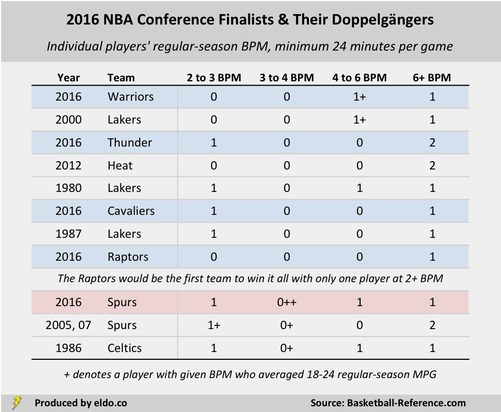 In the [seemingly] impossible scenario of a Raptors championship, they would be the first team since at least 1977 to win the NBA title with only one player at 2+ BPM. We threw the Spurs in for curiosity's sake, given they had an historically great season (gone too soon) and unbelievable depth. This season's vintage was similar in BPM terms to Pop's 2005 and 2007 teams, with a little less stardom at the top and a deeper cast in the 1-2 BPM range. Their star makeup also resembles the '86 Celtics. Comparisons aside, playing around with which star arrangements (if any) are superior is a topic for another day. For now, we don't need BPM to tell us that the Cavaliers will beat the Raptors in the east, and we'll leave it to Curry, Green, Westbrook, and Durant to sort things out for us on the court out west. 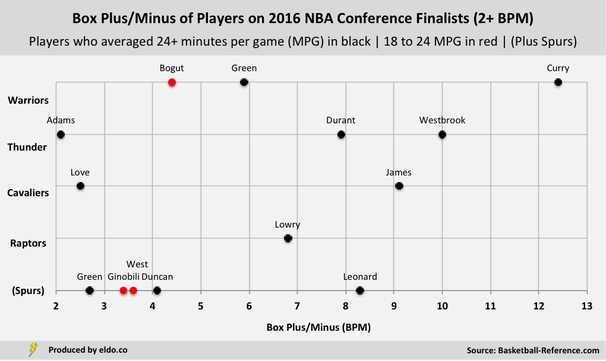 Box Plus/Minus (BPM) estimates “the points per 100 possessions a player contributed above a league-average player”. It is a rate statistic that does not account for playing time, so we excluded players who averaged fewer than 18 minutes per game (MPG) and denoted those who played 18 to 24 MPG. As we saw with Chris Bosh in the previous section, BPM is pretty unkind to Klay Thompson. He was second on the team in Win Shares and WS/48 in 2015, but slipped in those categories too in 2016 (behind Green in the former, and behind Green and Bogut in the latter, if we consider players with 18+ MPG). As noted in the previous section, if we reduce that minimum to 18 regular-season minutes per game, then the 2016 Warriors (Bogut), 2003 Spurs (Ginobili), and 2000 Lakers (Horry) would each have three players at 2+ BPM, leaving seven teams that won with two players at 2+ BPM (18+ MPG). And no matter what BPM tells us, it's hard to even imply that they're not. You see Game 2 of the Western Conference Finals? Games 1 and 2 of the FInals? The data source for this article is basketball-reference.com. Data was compiled and analyzed by ELDORADO. All charts and graphics herein were created by ELDORADO.